Accepts newest EMV/Smart Cards from Visa, MC, D, Amex for highest security, lowest fees! Run transactions at lightning speed over the high speed internet connection! 24MB memory for adding other apps, gift cards, etc. The Optimum T4220 provides IP performance and security second to none. 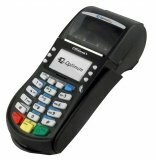 The Optimum T4220 comes standard with integrated PCI PED approved PIN entry capability, the safety of the HyperSafe32 architecture and unrivaled IP transaction and download speeds. The OptimumT4220 also shares the same user interface as the T4200 family dial and wireless models for ease of migration and support. The IP diagnostics application only found on Hypercom IP terminals is more than your average IP monitor, checking failure at the cable, in-store gateway, the ISP and then the processing host. It then clearly tells the user where the error occurred and then how to fix it! Don't just replace an IP terminal, fix the problem instead! Equipped with more memory than competitor models, the Optimum T4220 accepts more applications to meet your needs now and in the future.